If you are looking for excitement, the TRACKER XTR1000 is ready for you to mount up. 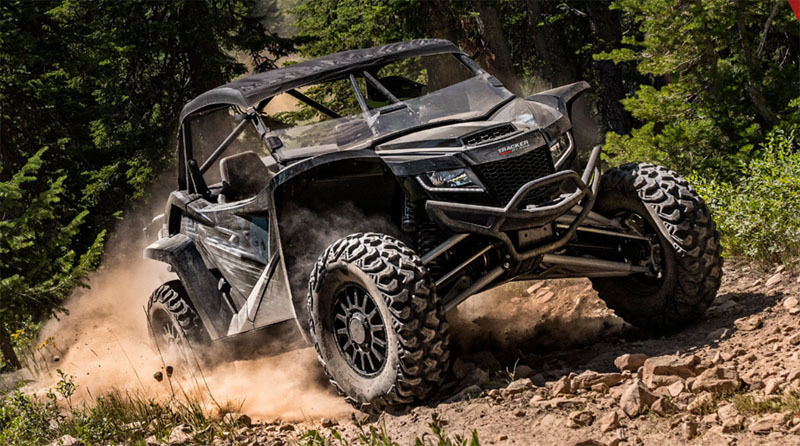 Its suspension system is inspired by off-road racing so you can stay in control while you attack the sand, dirt, mud, rocks and anything else in your way. Its engineering-driven 130hp performance is complemented with rugged construction and premium standard features to give you the ride of your life. 3-Point Seat Belts (4-Point and Click-6 Ready), Seat Belt Rev Limiter, Standard Full Doors, Race-Inspired ROPS with Front and Rear Intrusion Bars, 2 Passenger Grab Handles, Headlights, Brake Lights. INSTRUMENTATION: Dual Screen LCD Gauge with Seatbelt Indicator, High Beam Indicator, Oil Pressure Indicator, Coolant Temp. Warning Light, Check Engine Light, Engine Hour Meter, Odometer and Trip Meter, Clock, Gear Position, Diagnostics. STORAGE COMPONENTS: Cargo Bed, Glove Box, Cup Holders (2). Race-inspired rops with front and rear intrusion bars. Class-leading 4 gallon glove box. Class-leading 300 lb. rear cargo box with space for a 3 in. tire.